Yes, agree, Biggar should start, especially with no 1/2p. I think it will be the same XV that started v Australia, with Williams for Halfpenny. Bench probably similar too in Dee, Evans, Lewis, Ball/Hill (I would guess Hill), Jenkins, Williams, Biggar and I’m not really sure on the last spot (it might be Amos with his ability to cover 13-15 in theory, but I wouldn’t be surprised to see Patchell on there as fullback cover). I'd be very surprised if Biggar starts. Why would you be surprised Lucky? I think he is the best option at 10 for Wales given what I, and others, have said on this thread. Who do you see at 10? Biggar has been pretty average in a stuttering Saints team this season. If Halfpenny was fit, I would start Patchell, he is big and fast, like the South African backs, but as I reckon this will be won by the boot, like the Australia game, then I would start Biggar. He is no stranger to SA, and he has beaten them before, the kid can put a good shift in defence, and he has an excelent kicking game. It'll be Anscombe at 10. I think he's got the all-round game Gatland's looking for. SA backs bar Pollard, de Allende and Kriel not big at all. Biltong wrote: SA backs bar Pollard, de Allende and Kriel not big at all. Not big, or are everybody else getting as big ? I am yet to see a small rugby player, my nephew is in the Cardiff Blues academy he is 17 and built like a Greek god. RDW_Scotland wrote: Biggar has been pretty average in a stuttering Saints team this season. But very composed versus Tonga. Hes a test match animal and Gatland is a huge fan. I'd be comfortable with any of our 10s starting though I wouldn't want Gareth Davies and Biggar starting together. Luckless Pedestrian wrote: It'll be Anscombe at 10. I think he's got the all-round game Gatland's looking for. Yes I think that as well. But I think Biggar would be the better choice. I don't agree that he would be the better choice. Luckless Pedestrian wrote: I don't agree that he would be the better choice. Wales to win by 10. I think they have smarts to see this one home. Fingers crossed. You can't fault his commitment, but he's a limited player. He just doesn't make a backline tick for me. If you've got a monster pack or it's p!ssing down with rain, he'll be great, but we're not going to beat the Boks playing ten-man rugby. Anscombe looked very assured against the Wallabies, a match we actually won for once, so there's no reason at all that he should lose his shirt to the man who played ten in a win over Tonga. Luckless Pedestrian wrote: You can't fault his commitment, but he's a limited player. He just doesn't make a backline tick for me. If you've got a monster pack or it's p!ssing down with rain, he'll be great, but we're not going to beat the Boks playing ten-man rugby. Anscombe looked very assured against the Wallabies, a match we actually won for once, so there's no reason at all that he should lose his shirt to the man who played ten in a win over Tonga. Good point. I did not consider that, yes we beat the Aussies, the difference this time was Anscombe playing at 10. Perhaps he is the better choice. Who is for the bench though ? I think they'll go for Biggar on the bench, as he was against Australia. I really like Patchell, though. We're lucky to have a bit of choice at ten with the World Cup on the horizon. Luckless Pedestrian wrote: I think they'll go for Biggar on the bench, as he was against Australia. I really like Patchell, though. We're lucky to have a bit of choice at ten with the World Cup on the horizon. I am starting to see a little bit of light at the end of the tunnel in this regard. Also, have you noticed, how much experience we have in the front row, both starting and subs, and consider how young they all are ? Of all our front row, only one player is 30, Ken Owens. The rest are all mid twenties, I do not think any other nation could boast that. We're really well stocked at lock too, all of a sudden. It's good! Luckless Pedestrian wrote: We're really well stocked at lock too, all of a sudden. It's good! Yes, we would not have been saying that as little as two years ago. I'm still a bit concerned with our options at midfield. One injury and we're down to just two proven Test centres. Owen Watkin and Tyler Morgan are definitely still in the 'potential' camp for me. Plus I'm not sold on Gareth Davies as our starting scrum half. There’s no reason for any starter from Australia to lose their starting place, to be fair. Maybe only Beard for Hill or Ball, but I am sure with Beard’s height and weight it’s a plus potentially against the Boks. We can’t use a performance against Tonga as a yardstick really, whereas one v Australia it is fair to. Agreed. And I think we're improved by having Liam Williams at full back over Halfpenny. Luckless Pedestrian wrote: I'm still a bit concerned with our options at midfield. One injury and we're down to just two proven Test centres. Owen Watkin and Tyler Morgan are definitely still in the 'potential' camp for me. Plus I'm not sold on Gareth Davies as our starting scrum half. A bit thin on the ground I agree, but we have plenty to work with. I am sure there are others I am not considering as well. What troubles you with Gareth Davies ? I prefer him to Webb. I don't think he offers the control from scrum half that you need, regardless of who your outside half is. The problem is I'm not sure Tomos Williams is the answer either. They're both players you'd want to bring off the bench, IMO. Maybe give Williams a couple of starts in the Six Nations. Luckless Pedestrian wrote: I don't think he offers the control from scrum half that you need, regardless of who your outside half is. The problem is I'm not sure Tomos Williams is the answer either. They're both players you'd want to bring off the bench, IMO. Maybe give Williams a couple of starts in the Six Nations. He is a bit of a maverick isn't he ? He will tap and go one minute and get isolated, and he will be sublime the next minute, I think he is our best option though, even when you consider Williams, Aled Davies, Rhys Webb. there was a young scrum half playing for Dragons last season who impressed me, I have forgotten his name now though, but they are out there. I thought Rhodri Williams might end up being a dark horse for the World Cup squad, but it really hasn't happened for him so far. I will not comment on BJ. It’s clearly coaching with Rhodri. You can’t go from being as electric as he was at Bristol, to being as pragmatic as he is now. Babos has been a little mistreated, going from near first choice to fourth mind. At Bristol he'd have always been on the front foot, playing against teams well below the standard of his own. Now the boot is on the other foot. It probably will be almost identical to the team that took on Australia. Shifting Anscombe to 15 and starting Biggar at 10 wouldn’t be a bad option. 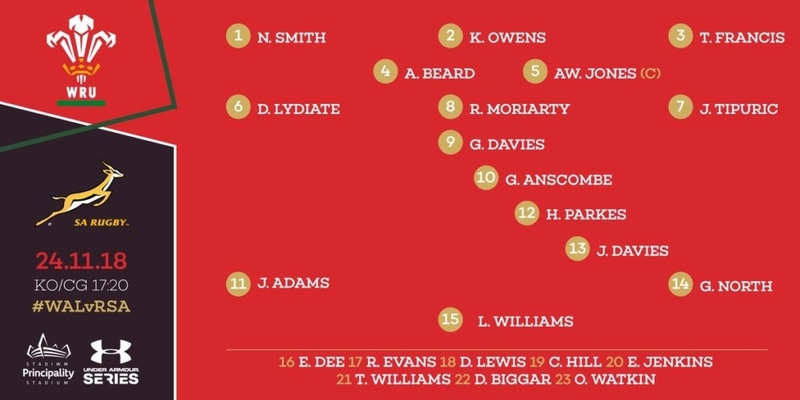 Or it could be Williams to 15 if North is fit, with Adams on the other wing - Gatland will like the physicality. I’m still for swapping Parkes for Watkin, the former looking out of place thus far in the campaign - not sure why though. I guess it's a strong team, but for some reason it doesn't fill me with enthusiasm. The Oracle wrote: I guess it's a strong team, but for some reason it doesn't fill me with enthusiasm. That was a dire match, can'ttake too much out of that match apart from the result. For me, Smith, Beard and Lydiate would be the big changes I'd make. Rob Evans is top class, I know he's on the bench, but he'll have a bigger impact starting. Ball was brilliant, and I like his added grunt that we don't always seem to have in the forwards. Lydiate is effective, but to me he brings similar attributes to Moriarty, Wainwright is unlucky. I agree. Rob Evans would start for me. And I think I'd agree on Ball for Beard. I might have been tempted to go for Patchell at 10 to link up with his Scarlets 9 and centres, with Anscombe on the bench. That sort of understanding developed over a few years of club play might buy us some important speed and time at this level. But Anscombe has been playing well so no real issue for me. I just don't think Liam Williams is in great form and wonder if he'll boil over against a physical boks team and spend time off the field. Others might have cooler heads for such an encounter. If not LW then who at FB? Which is why I wondered about Anscombe. Kind of pointless calling Amos up officially in the week. Team as expected for me. I didn’t think he would go Watkin as number 23 mind. If we base this on the presumption that the Boks are better than Aus at the moment (which they perhaps have not always been in the past few years when we've been able to beat them) then we'll need to do a lot more in the Boks game than we did in the Aus game. I'm hoping we can be more competitive in the contact area and rucks than Scotland were but we also need a bit of invention (like Scotland did) to get points on the board. I just hope that the team picked, and the gameplan chosen, is one of variation where we don't just do the same thing over and over and hope it eventually works or tires the opposition out! We need some sneaky lineout moves (like Scotland), dinks over the top, grubbers through, kicks to the wings, etc. The Boks will just soak up the 'drift attack' all day if we don't vary things. At least Rassie is keeping the continuity. What do you reckon then, Biltong? Will you be ending the tour with a win? I can only hope, we have played terrible rugby against Wales the last number of years. Maybe for a neutral. It was a very hard fought test match, and in test match rugby its only the result that matters. Are you going to claim moral victory by scoring more tries but still losing by a point ? For me when it comes to the Springboks the result is only half the equation. I have seen the Springboks lose to the Lions scoring three tries to nil, I have seen the Boks beat New Zealand scoring less tries. It is the control, the intensity, the execution that is important for me. Tight fought test matches are brilliant, this past weekend the Ireland vs All Blacks was an enthralling contest. Each to their own, it was much better than Eng v SA though. England SA was very frustrating to watch.